We have very sad news. Our great and dear teacher Ven. 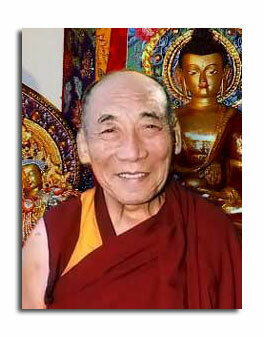 Geshe Gyeltsen passed from our world today, Friday February 13th at around 12:20 p.m. Ven. Geshela died peacefully, surrounded by monks from Gaden Shartse Monastery and family members. All prayers and necessary rituals were performed by the monks. His Holiness the Dalai Lama and other lamas called and spoke to Ven. Geshela earlier this week. Please pray for Geshela's swift return to continue his teachings for the benefit of all sentient beings. Students are encouraged to include the King of Prayers into their daily practice, wishing Geshela to return quickly to continue to teach us. Venerable Geshe Tsultim Gyeltsen was born in 1924 in the Kham province of eastern Tibet. His parents named him Jamphel Yeshe and at a young age he was inspired by the example of his uncle who was a monk at the local monastery. When the boy was only seven, he and his family decided that he would enter monastic life. For nine years he studied sutra and tantra and received teachings on dialectics under the tutelage of Geshe Jampa Thaye, a highly respected teacher from Sera Monastery. When he was sixteen, Geshe Gyeltsen decided to continue his studies and left for Lhasa, the capital of Tibet, to study for his Geshe degree at Sera Monastery. The Geshe degree in the Gelug school is comparable to a western doctorate in Buddhist philosophy. Thie difference is that it usually takes more than twenty years to complete. Geshe-la set out on the thirty-three day trek across twenty-five mountain passes, the only monk in a party of fifteen merchants and pilgrims. Near Lhasa, they stopped near Gaden Monastery where some monks invited Geshe-la for tea the following day. The next morning as he climbed the hill toward Gaden, he saw the great monastery for the first time looking as though it would touch the sky. He wept tears of joy and knew without question that it was here, and not Sera, where he would continue his studies. That day was the anniversary of Lama Tsong Khapa's enlightenment. In the evening the light offerings of butter lamps and the sound of chanting filled every room in the monastery and Geshe-la felt deeply moved by its spiritual atmosphere. He joined Shartse College, one of Gaden's two main colleges. The abbot at that time was the late Kyabje Zong Rinpoche who took a special interest in the young monk's progress. Geshe Gyaltsen studied logic, wisdom, compassion, ethics, phenomenology and mind training at Gaden for twenty years and later became a teacher of junior monks. 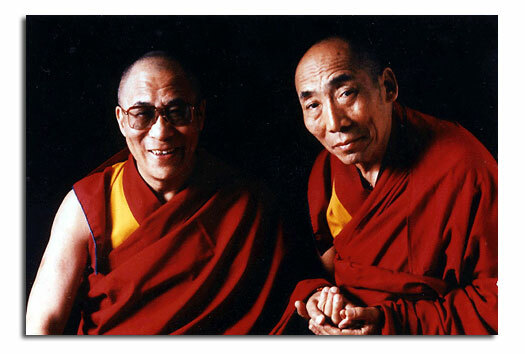 After the Tibetan Uprising of March 10th, 1959, word reached Gaden that the Dalai Lama had left Tibet. Geshe-la and a group of six other monks left the monastery after evening prayers and made their way to india across the Himalayas; members of a mass exodus fleeing the oppression of the Chinese Communist occupation. Geshe-la was one of the few senior monks who managed to escape out of the twenty thousand monks that had lived at Gaden, Sera and Drepung, Tibet's three largest monasteries. In 1963 Geshe-la traveled to Sussex, England to teach at the Pestalozzi International Children's Village. He arrived with twenty-two Tibetan children who were mostly orphans or the children of parents still living in Tibet. For seven years Geshe-la instructed these children in Tibetan writing, grammar, culture and Buddhist philosophy. Geshe Gyeltsen came to the United States in 1976 and briefly held positions at the USC, at UC Santa Barbara, and at UCLA where he taught meditation and Tibetan language. His university students requested that he start a teaching center and in 1978 Geshe-la founded a center for the study of Buddhism in Los Angeles. Geshe-la requested His Holiness the Dalai Lama to name the center and His Holiness gave the name of Thubten Dhargye Ling, which means Land of Flourishing Dharma. Thubten Dhargye Ling is now based in Long Beach where Geshe Gyeltsen held classes in meditation, lead retreats, celebrated religious holidays and gave regular teachings from traditional Buddhist texts. Geshe Gyeltsen is the author of 'Compassion: The Key to Great awakening', a commentary on the Eight Verses of Mind Training and the Thirty-seven Practices of a Bodhisattva and a free book on emptiness 'Mirror of Wisdom' (free download below). He has founded centers in both Colorado and Texas and has students based in Mexico, Alaska, Omaha and England. Geshe-la has also been involved in the Buddhist Sangha Council of Southern California, a group of representatives from various Buddhist countries dedicated to the further understanding between Buddhist cultures. He actively worked for human rights and true autonomy for the Tibetan people. One of his goals was to further education and religious study in Tibetan communities throughout India. Geshe Gyeltsen was known for his great compassion and personal warmth; yet he retained a very traditional and uncompromising approach to teaching the Dharma. His strength of vision and devotion to his practice transcend time and culture, and he will continue to inspire his students with the legacy he has brought from Tibet. Buddha Shakyamuni taught the Perfection of Wisdom, otherwise known as the Wisdom Gone Beyond, on Vulture's Peak, Rajgir, in what is today the Indian state of Bihar. These sutras focus on the subject of emptiness, the ultimate nature of reality, and the Heart Sutra is one of the most significant. It is a beautifully condensed version of the Buddha’s teachings on emptiness, containing their essential meaning in only a few lines. Geshe Gyeltsen tells us that by integrating this teaching with our minds, it is possible for us to become enlightened within a single lifetime. Mind Training Like the Rays of the Sun was authored by Namkha Pel, a close student of the great Tibetan scholar and yogi, Lama Tsong Khapa. It is a commentary to the Seven Point Mind Training, which was composed by the Kadampa master, Geshe Chekawa. The mind training tradition was introduced to Tibet by the renowned Indian master Atisha and contains practices for generating bodhicitta, the altruistic attitude that seeks enlightenment for the sake of others. 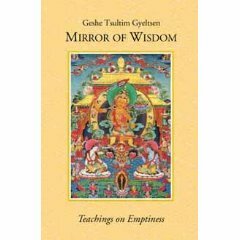 In this book, Geshe Gyeltsen focuses on the emptiness section of Namkha Pel’s text. Geshe Gyeltsen gave this commentary on the Heart Sutra over a period of months, beginning in May, 1994, when his center, Thubten Dhargye Ling, was still located in West Los Angeles. By the time he gave the teachings on the emptiness section of Mind Training Like the Rays of the Sun in September, 1996, Thubten Dhargye Ling had moved to its present location in Long Beach.